Find homes for sale! Mobile real estate search is now quick and easy with the most accurate app for searching homes for sale in Ocean Reef, Florida. With a tap, see pictures and detailed information on all homes for sale in vivid high resolution clarity. Search nearby homes for sale while you drive through neighborhoods, wait in line, hang out with friends, at home, work, or restaurants. Searching homes for sale, no matter where you are, is now so easy with the Mary Lee Presents Ocean Reef Properties Real Estate app. 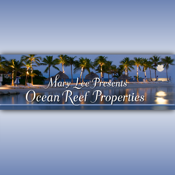 The free Mary Lee Presents Ocean Reef PropertiesiTunes app is customized and optimized for our local market here in Ocean Reef Florida. Find real estate listing details, share your favorite homes on Facebook and Pinterest, email homes to your family and friends, tag homes as your favorite, add and remember saved home searches, unlock any home for a tour, and view photo slideshows.